As I have previously done with The Ultimate Rolex Library, I would like to put together a list of of Omega reading material which I think is essential to the collector. Any additions or recommendations are welcome. I've divided this site into two sections. The first section will be on Omega watches in general, the second section will cover the Omega Speedmaster. Feast For The Eyes - Omega Designs by Anton Kreuzer is the only hardcover book in English, that tries to give an overall history of the Omega Watch Company. It was originally published in German and released in English in 1996 by Schiffer Publishing. I was rather disappointed with this volume. Although there are some nice photographs of watches, there are not many rare or unusual watches seen. I'm not sure whether it was lost in the translation, but the history of Omega seems to be lacking. Pictures of the movements and calibres look like they were photocopied from some old Omega catalogues. The price guide compiled by Gertraud Hechl is a waist of time. Although I do not possess this book, by its description it seems worth getting. It is 488 pages in length and is written by Marco Richon. It is well illustrated with 237 colour and 768 black & white photographs. It has an in depth history of the firm and watches produced over the years. 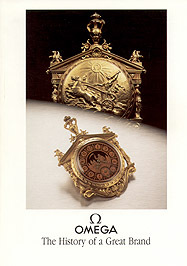 Published in 1998 to celebrate the 150th anniversary of Omega. It's only available in French. The Omega Book is exactly what Omega Designs should have been. Although printed in Japanese, this is a must have! It is a GoodsPress (Japanese magazine) Special edition. It is written by Masaharu Nabata and published by Tokuma Shoten. It is packed with beautiful glossy photographs of watches, advertisements, movements, accessories and books. 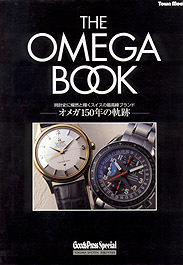 Chapter 9 is titled the Omega Museum and illustrates many rare Omega watches. If you can read Japanese, you will appreciate interviews by Nicholas G. Hayek, Chairman and C.E.O. of the Swatch Group, Jean-Claude Biver, President of Blancpain and Micheli Sofisti, the President of Omega. The next publication is the Time Spec Magazine. I've already written about this Japanese magazine in The Ultimate Rolex Library. Issue 26 features Omega. It's nice to see a variety of Constellations and Seamaster rather than the Speedmaster which usually predominates Omega articles. The next publication is from Omega themselves. 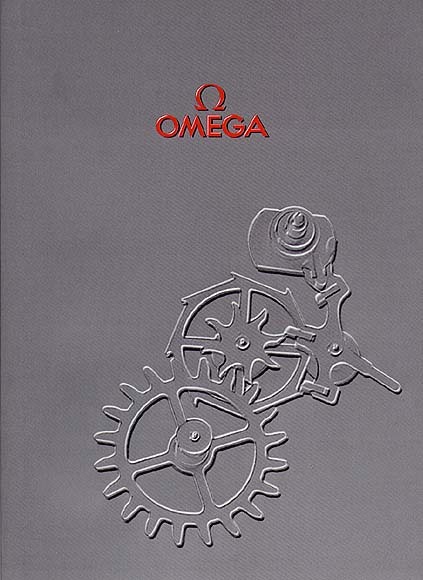 Omega - The History of a Great Brand was available from various Omega distributors and the best thing, it was free. This 50 page booklet has nice photographs of their significant watches. The history is brief and concise. Also worth obtaining are catalogues from the company. A new Omega publication is the hardbound book with dust jacket titled, "DeVille Co-Axial Escapement". This little book explains the development and workings of the movement. It uses photographs and diagrams to illustrate the escapement. The rest of the book features the current DeVille collection. 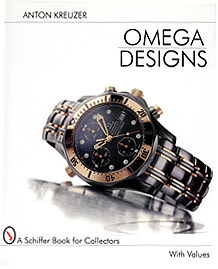 The above two books should be in any watch book collection and not just for Omega fans. Next to Rolex, Omega has produced the second most number of chronometers. 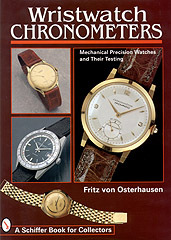 Wristwatch Chronometers by Fritz von Osterhausen and published by Schiffer Publications, is a great book on the subject. There are many wonderful colour photographs of Omega watches and movements. Most welcome are Omega chronometers which are not Constellations. 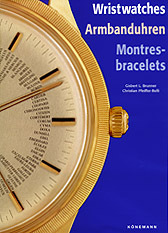 Wristwatches by Gilbert L. Brunner & Christian Pfeiffer-Bell, published by Könemann, is a bargain. This tome is 512 pages in length, has over 2100 photographs and describes 83 different watch brands. It's in English, German and French text, it features many vintage Omega watches and is relatively up to date as it shows George Daniels' Co-axial Escapement DeVille. As I have mentioned elsewhere, Time Spec is easily the world's best watch magazine. The best of the English language ones are International Wristwatch and Watch Time. I have been collecting the U.K. edition of International Wristwatch for a decade or so. The first English edition came out in 1989 and it is styled on the Italian magazine,Orologi da Polso. 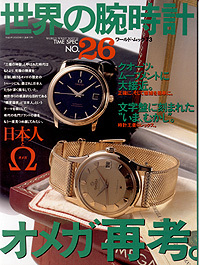 As of writing (June 2001), there have been 62 issues of International Wristwatch. It is issued in various languages including German and Chinese, and the U.S. edition is usually completely different to the U.K. issue. Watch Time is far superior to International Wristwatch. It is a great watch magazine and comes from the German watch magazine family of Chronos, Uhren Magazin and Klassik Uhren. The articles are more detailed and in depth. Click each magazine for its corresponding web site.